The accelerated development of an economic zone on the western side of the Taiwan Straits is tipped to be the main topic of conversation at this year's China International Fair for Investment and Trade (CIFIT). The trade fair will be held in Xiamen, a coastal city in Fujian province that looks out across the Straits towards Taiwan. The event opens on September 8 and is said to be the largest international investment event ever to be hosted in China. Aside from developments with the economic zone, the four day event will also attract global attention as delegates wrangle with the still pervasive issue of the worldwide financial crisis - with many hoping to find solutions to their fiscal ills during their visit to the southeastern province in China. Speaking at a news conference in Beijing just two months to go before the event, Chen Jian, vice-minister of commerce and deputy director-general of the organizing committee of the 13th CIFIT, underlined the importance of the proposed new economic zone. Chen told the conference: "On May 4, the State Council gave its blessing to the development of the west Taiwan Straits economic zone and acknowledged its potential significance as an important frontier platform for cross-Straits economic exchange and cooperation. "The west Straits zone, including Fujian, east Guangdong, south Zhejiang and east Jiangxi, has the potential to become a major growth engine for the country, complementing the existing powerhouses of the Pearl River and the Yangtze River deltas. "Such an ambitious program will be achieved through the construction of a large number of infrastructure and industrial projects. This will require substantial investments from both at home and abroad." Chen said a large number of investment projects from around China and in a number of overseas settings would also be promoted during this year's fair. The vice-minister said Chinese and overseas businesspeople would be welcome to participate in many forums, symposiums and exhibitions at this year's event. He said that this would allow many of the foreign delegates to familiarize themselves with China's latest fiscal stimulus initiatives, its anti-protectionism policies and also give them the opportunity for face-to-face dialogues with their Chinese counterparts. Chen said: "The current financial crisis has had a negative influence on multinational companies' willingness and ability to invest. 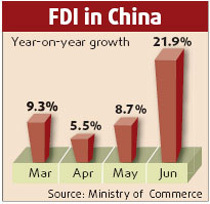 As a result, China has seen a decrease in foreign direct investment (FDI) for eight consecutive months now. "However, the country's stimulus policies are now set to drive growth and are expected to show positive effects in the near future. This will give new opportunities for international investors." Chen said the Ministry of Commerce was currently drawing up new policies aimed at boosting FDI levels and that a number of these initiatives would be announced prior to the CIFIT. Compared with difficulties in attracting inbound investment, Chen said Chinese enterprises were demonstrating increased momentum in their own overseas business activities. In the first quarter of 2009, the number of newly established Chinese-funded businesses operating overseas was 445, an increase of 6.8 percent year-on-year. Chen said: "The current low operating costs make this the right time for Chinese enterprises to go overseas. The 13th CIFIT conference will be an ideal opportunity for Chinese businesses to talk to foreign companies and governments and discuss the abilities of opening businesses abroad." Attending the same press event, Ye Shuangyu, vice-governor of Fujian and deputy director-general of the organizing committee of the 13th CIFIT, outlined a number of new features making their debut at the 2009 event. Ye said: "We have identified real estate, creativity, tourism, agriculture and the development of economic zones as the key sectors for this year's fair. The event will see the establishment of a dedicated real estate hall, a creative industry hall and an agriculture hall for the first time. "Cross-Straits economic exchange will be another highlight of this year's fair and, for the first time, we will be staging a 'Taiwan Day'. Cross-Straits business activities will also feature in areas such as the Taiwan investment zone and the Taiwan commodities zone." According to the vice-governor, 59 countries and regions have already agreed to send delegations to the event and the number is expected to reach 80 before the fair opens. Representation is also expected from 250 investment promotion organizations and industrial associations from some 60 countries and regions, including the United States, France, Italy, the United Kingdom, Australia and Brazil.